Imagine you’re at work, and you need to complete a task that’s completely new to you. What do you do first? You might ask another coworker for tips. Or maybe you’re more the type to do some research on your own, and then share that with new people who join your department. 70% of learning is experiential. It happens through daily tasks, challenges and practice. 20% of learning is social. It happens with and through other people, like coworkers. 10% of learning is formal. It happens through structured training courses and programs. First, let’s look at some background info for the 70:20:10 model. Two 70:20:10 models exist in business—the model for Learning & Development and the one for Managing Innovation. I’m going to focus on the L&D one today. The 70:20:10 model for Learning & Development was developed from research at the Center for Creative Leadership (CCL) in North Carolina beginning in the 1980s. Today, it’s an L&D strategy to improve workplace performance. Make the most of that 70% of learning. Take a closer look at the activities that make up the 70% of experiential learning. Performance support is an important part of this 70%. (Any time an employee needs to reference something on the job with training or reference materials, that’s performance support.) You can do a few things to make sure your performance support system is effective and helpful. One important part of this is using the right learning management tools. With a learning management system like CourseMill® LMS V7 with advanced learning analytics, you can get the data you need to make sure your performance support materials being used effectively. Plus, you can make performance support available on mobile devices with CourseMill® Mobile. It’s convenient and an effective way to make the most of that 70%. To learn more, check out this infographic: Are You Going Mobile the Right Way? Don’t forget about the 20%. Social learning happens naturally, from one employee to another, so you can’t force it. However, you can facilitate it and provide the right tools to encourage it. Look for an LMS designed for quick and easy informal knowledge sharing, like CourseMill® Wave. And to learn more about social learning, check out this blog post: Social Learning for Online Training. Be aware of the 10%. One misconception is that the 70:20:10 is anti-training. This is false. However, since formal training makes up the 10% at many organizations, you want be sure that it’s quality training. Think of formal learning as the foundation and starting point from which experiential and social learning can develop. If your formal learning foundation is solid, the experiential and social learning that follows will likely also be more active and successful. 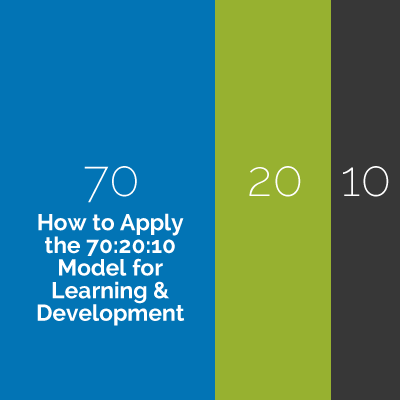 Use these tips to try the 70:20:10 framework for Learning & Development at your organization. Want more tips like this? Head over to the Lectora® e-Learning Blog, where we post about the latest trends, development strategies and learning tricks.